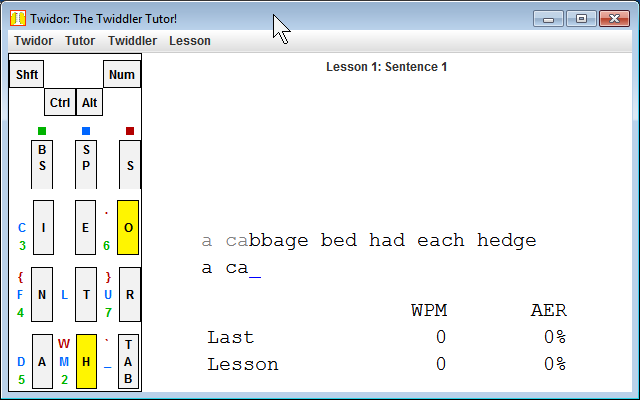 I have modified Twidor to read keymaps exported from twiddler tuner web app in CSV format. This is a very rough draft. I've only tested as far as loading the backspice keymap, and verifying that it shows twiddler key labels for alphabetic keys of backspice map. It's not been tested beyond that, so just be aware there may be issues. @rich When I run Twidor.exe on Windows 10, I got "Fatal error: Excelsior JET 12.00 installation cannot be found." It's missing a portion of the runtime. I'll post an update when it's resolved. Twidor-setup.exe should resolve the install issue. It works now @rich. And it displays MCCs suggestions correctly. I did notice that thumb keys need to be mirrored to match the rest of the buttons. Yea, the thumb button right/left orientation seemed awkward to me too. I'll flip them vs the keyboard in the next release. - flip thumbpad orientation to match keypad. - adds an anti-aliased Roboto font for improved legibility. Bug reports are also welcome on the github issue tracker. This release is feature complete with respect to my initial goals. * New menu item, File > Load Lesson, used to train on arbitrary ascii text files. * New implementation of sentence display to fix the spacing between letters (kerning). 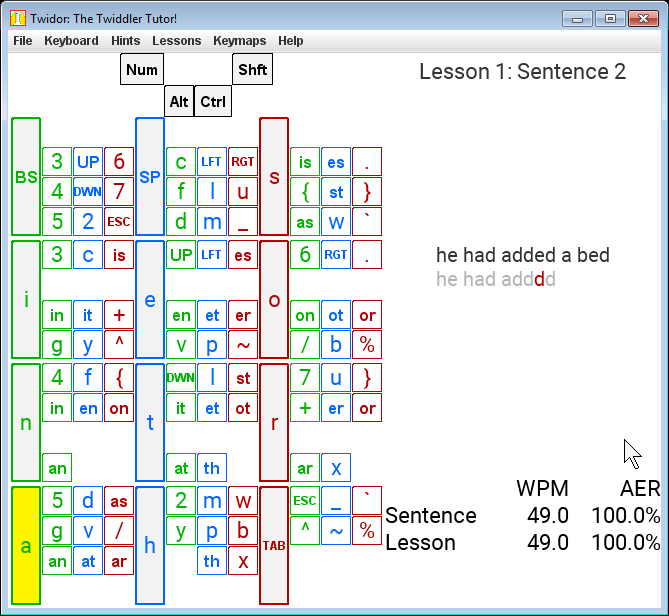 * Keymap shows all two-button chords. * Keymap shows first three letters of macros. * Embed a few more keymaps (backspice, typemax, tabspace 3, standard v5). Please let me know if you have any ideas, preferences, feedback! In the 1.5 release, I've added a menu item for certain popular keymaps: Backspice, Default_V5, TabSpace, and Typemax. I've looked at displaying the mouse button labels for Typemax, and there's a catch as it stands. 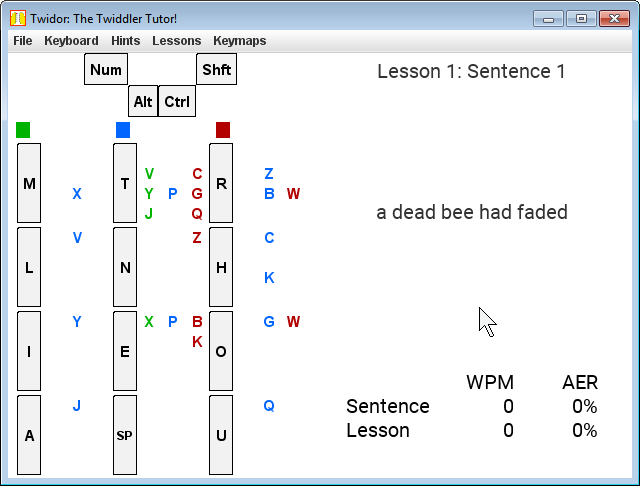 The Twiddler Tuner exports a keymaps as CSV; however, this excludes the mouse buttons. So, to support display of mouse button labels for Typemax in Twidor, I'll need to change to binary keymap files. So it's going to take more time to implement binary cfg file import in order to display of the mouse button labels. Meanwhile, here's what the Typemax keymap looks like in Twidor. 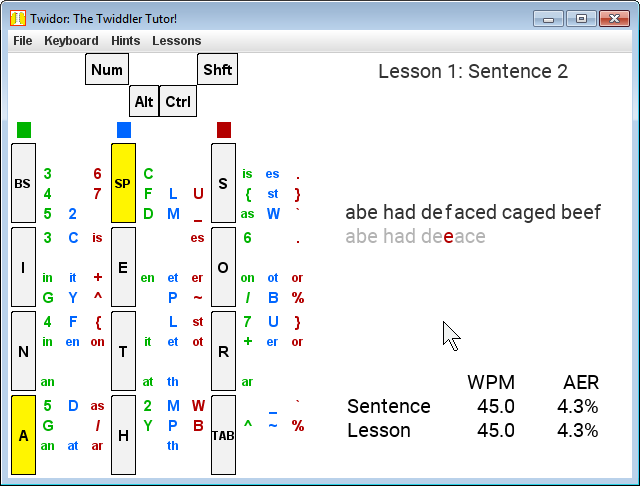 - Training on capital (uppercase) letters is now supported. @rich all MCCs in BackSpice layout now just consist of the corresponding letters. They are really shorthands rather then MCCs. I wonder if there is enough value of putting them on the screen. I feel the screen became quite busy. Yes, that screen is quite busy. I'm glad you brought this up. In version 2.1, the default display has changed to show only single buttons. Users can enable the more detailed display via View | Show Chords. In release 2.2 and later, there is a package (.deb) available for Debian and Ubuntu. 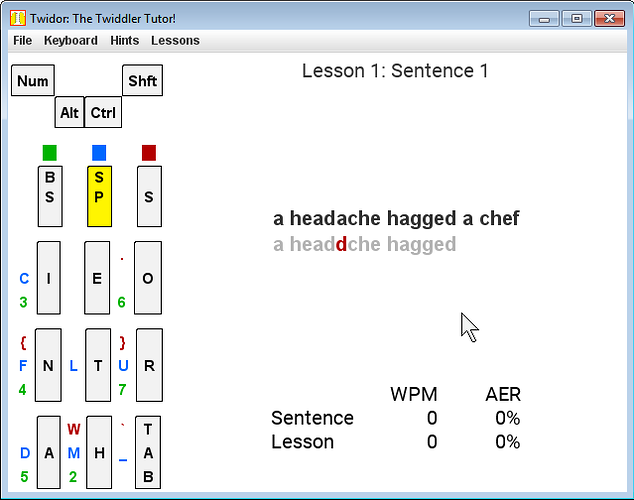 - Restore user's View, Keymap and Lesson menu choices upon restart. I checked out the source, and it seems to be missing the TwidorPreference class. Could you push your copy to github? I've pushed TwidorPreference.java to github. Thanks for catching that!